Happy Friday! 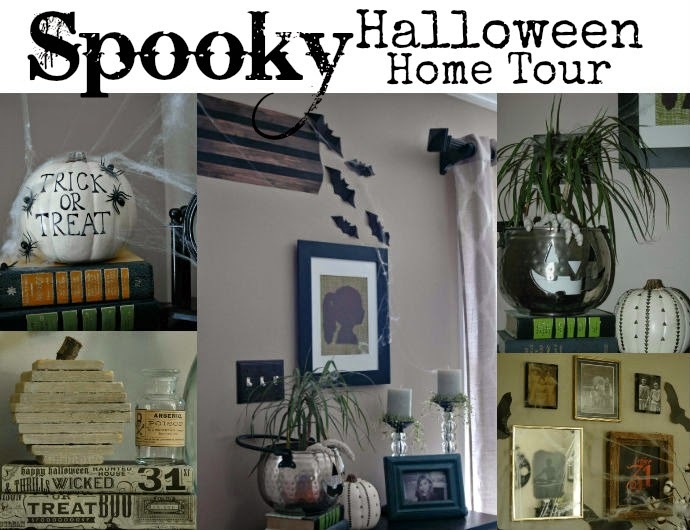 If you're visiting from the Halloween tour, welcome, and thank you so much for stopping by. 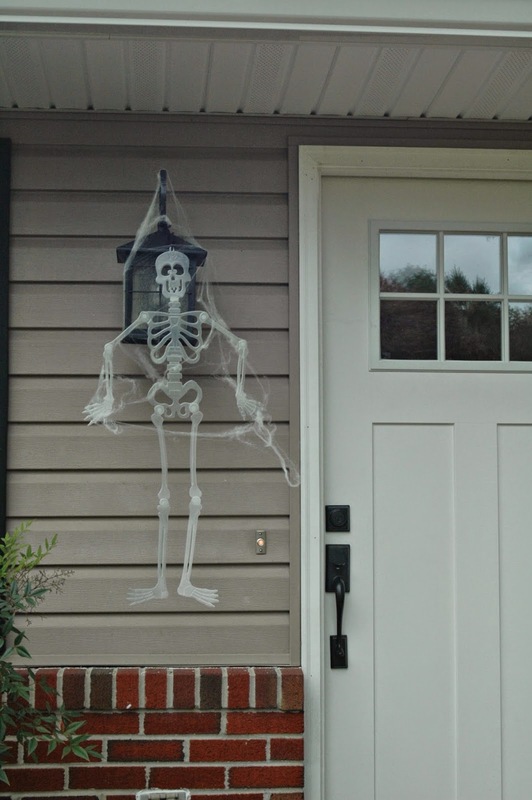 I had a lot of fun decorating my home this year for Halloween. It's the first year that I really went all out with making decorations. Even though their only up a few months, I love how they put me in the mood for Halloween. Not to mention that the kids love having the house all decorated. 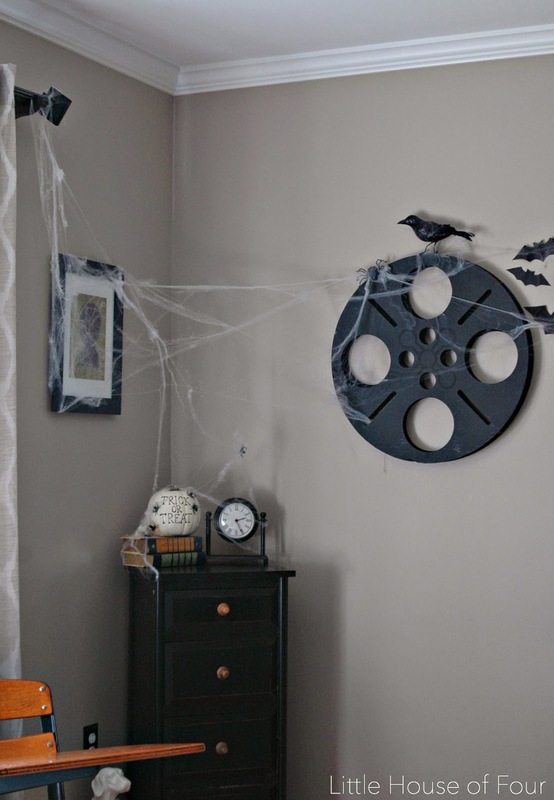 The gallery wall has to be my absolute favorite part of my Halloween decor. 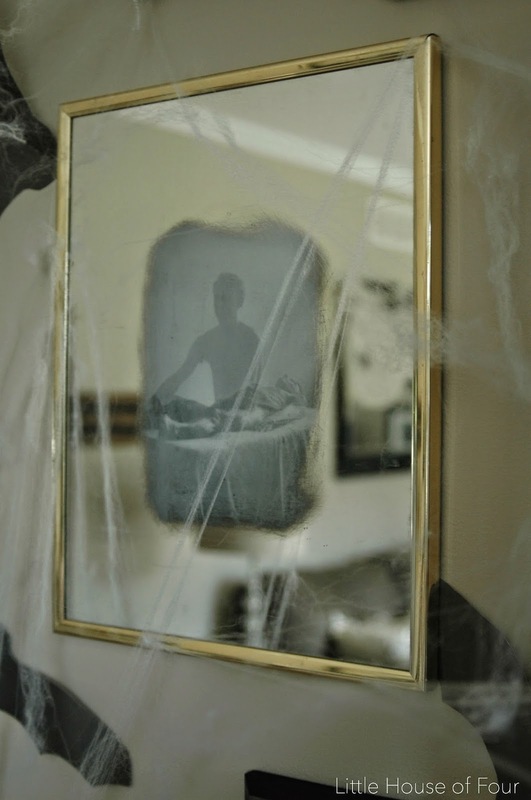 It's made up of Goodwill frames and spooky pictures that I printed off the internet. The entire project cost about $6.00. This is the first year I tried this cool mirror effect and love how it turned out. I mean, seriously, how freaky does that picture look? 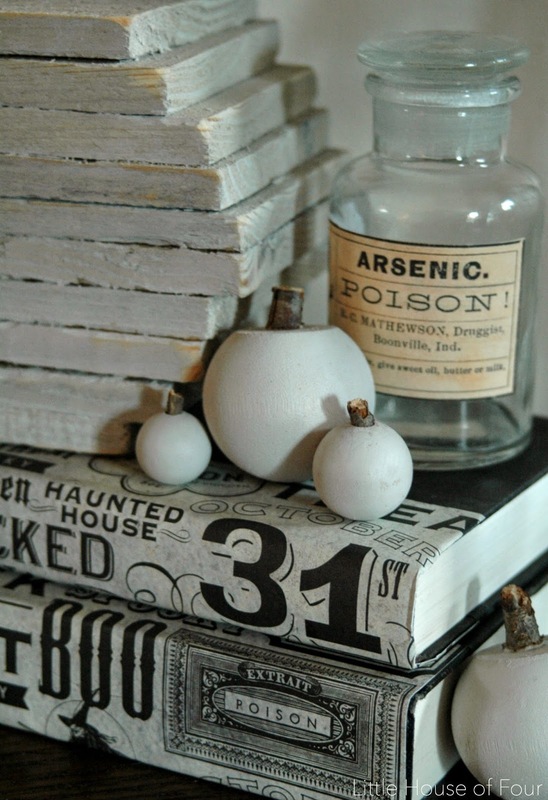 Along with the inexpensive gallery wall I also made a few other fun decorations, including wooden pumpkins, Halloween books and faux exposed wood. You know, because every old house has falling down walls. 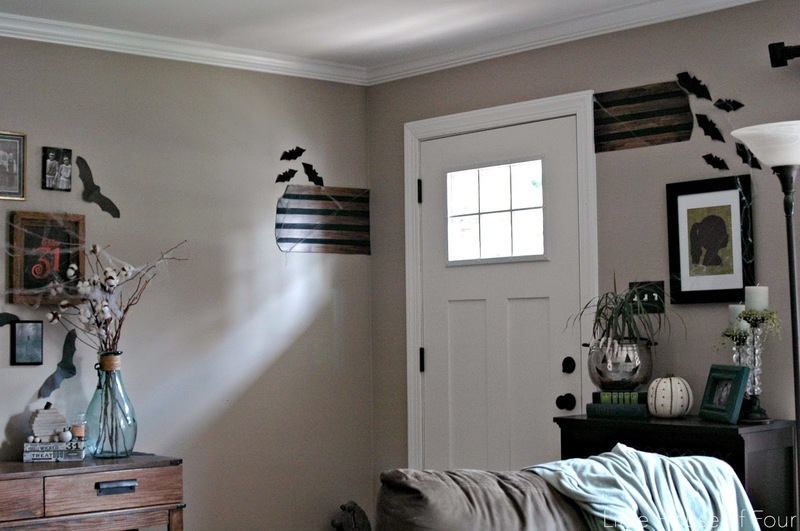 I also went a little bat crazy and cut out about 50 bats using this super handy printable. The Halloween fun doesn't stop here! 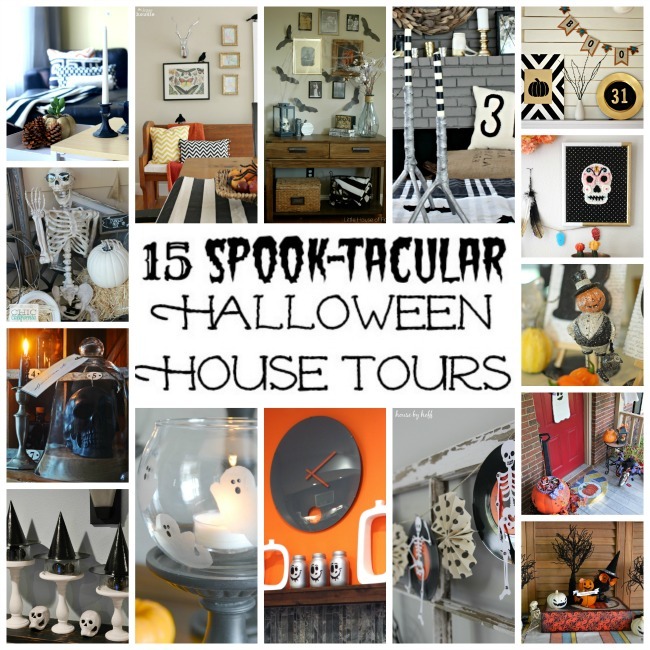 There are 14 other talented bloggers who are featuring their own spook-tacular homes. Thanks Lindsay! 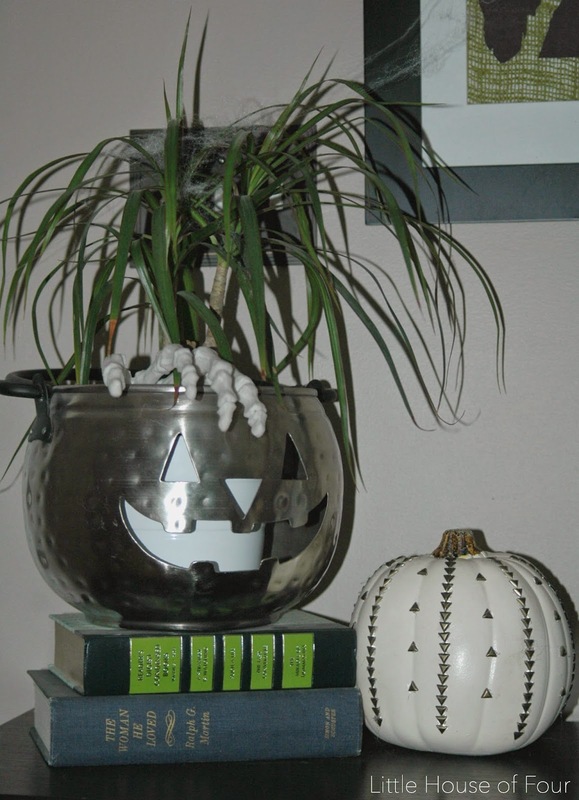 It was a lot of fun to make, not to mention super inexpensive! Did you ever go all out! SO much fun Katie!!! 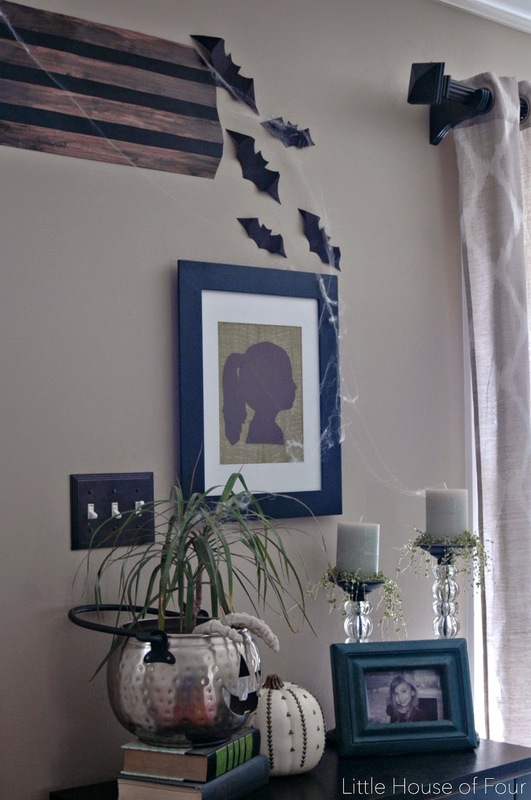 The cobwebs look fab and that gallery wall is so spooky and fun! You must be the coolest Mom ever! 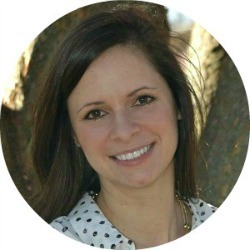 Thanks Kristi! I hope my kids think I'm a cool mom, LOL! 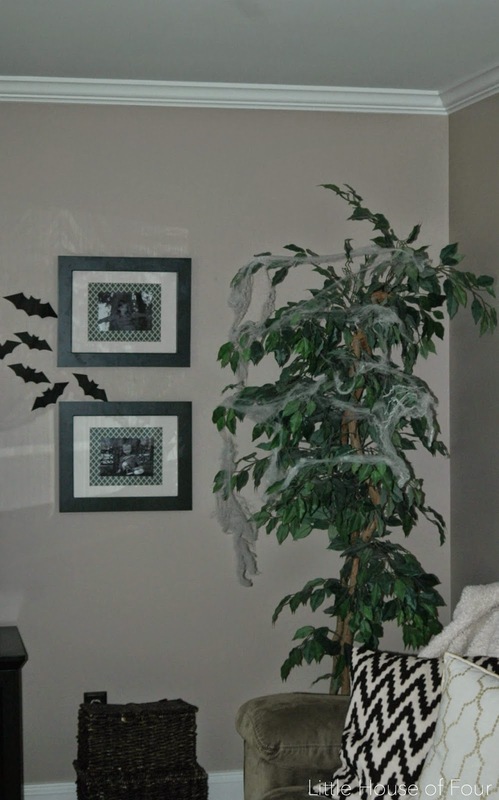 They definitely love the house all decorated and surprisinlgly aren't scared of the freaky pictures! I know! 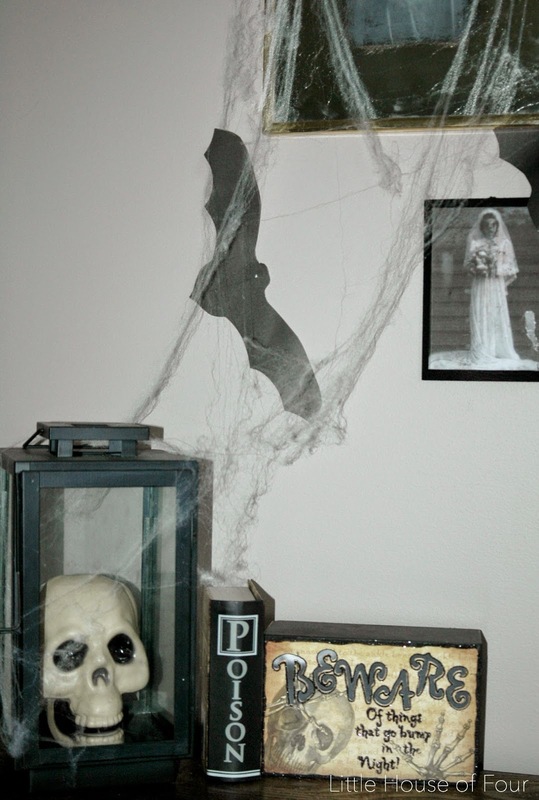 I told my husband that I won't have to dust all month since it will all blend in, LOL! Thanks for stopping my Adrienne! I love this! 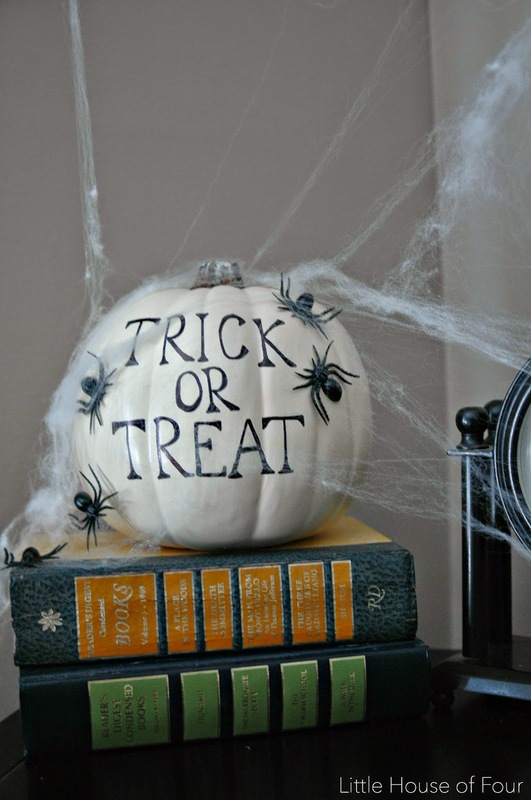 So super fun and just the right amount of spooky! Did your hands hurt from cutting out that many bats?? 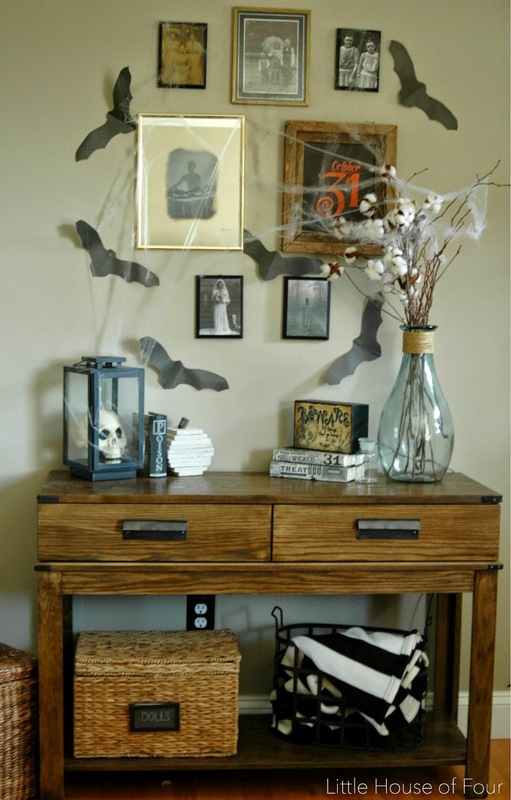 That gallery wall is totally spooky! The mirror effect is so cool too! Thanks Alexis! 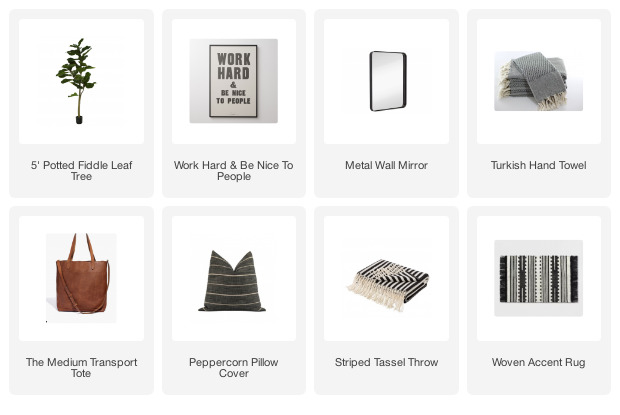 I had a lot of fun creating the gallery wall. Thanks Ashlyn! I am SO ready for Halloween! I'm glad you enjoyed the decor! Thanks so much for stopping by, Aniko! this is great! The spider webs give it a really creepy look. looks awesome! Fabulous! I love it all. So tasteful and fun AND FESTIVE. 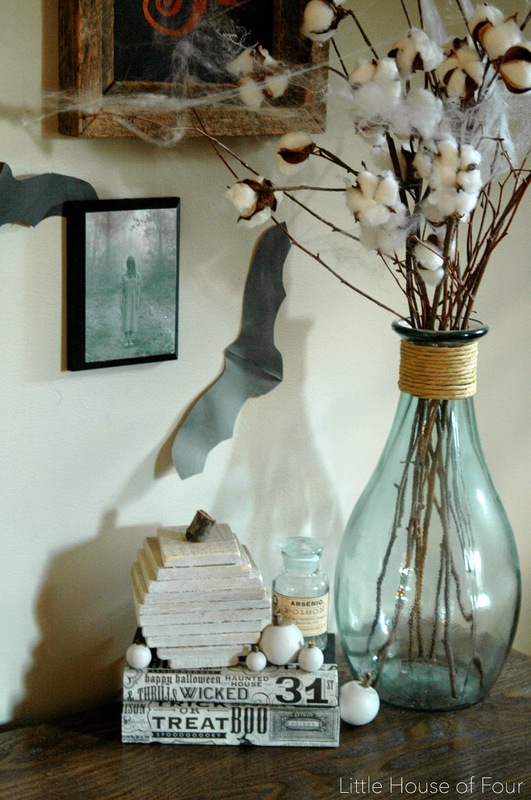 Awesome tour Katie - I love the vignette on your entry table especially! And all the spider webs! !